With a tsunami of marketing tools flooding the internet, all of which are vying for your attention, it’s easy to get overwhelmed with the huge number of choices available to marketers. That is why I wanted to put together this guide to the ultimate marketing toolkit — a set of tools that can help you build awareness, maximize traffic, improve conversions, and build a loyal tribe of customers. Chatbot building platform — to improve user experience on your website and to provide quality customer service. In this guide, I’ll recommend one service for each of the above tools and explain some of its key features. The total monthly spend on this marketing toolkit is just over $500 if you sign up for the basic monthly plan for all these tools. 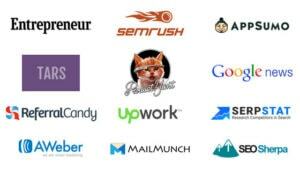 But if you use these tools effectively, the ROI is infinitely higher. All tools (except Mailshake) provide free trials, ranging from 7 days to a month. Links to free trials are given below description of each tool. If you haven’t used any of them before, I’d urge you to sign up for the free trial. That being said, let’s dive right in. Although SEO and PPC are on two different ends of the spectrum, both strategies have a common goal — to increase your website traffic. Because most SEO tools have keyword research capabilities, their usage can be extended to optimizing PPC campaigns as well. And the tool I’d recommend to do all of the above and more would be SEMrush, the preferred tool for SEOs and marketers all around the world, used by over 1 million users. 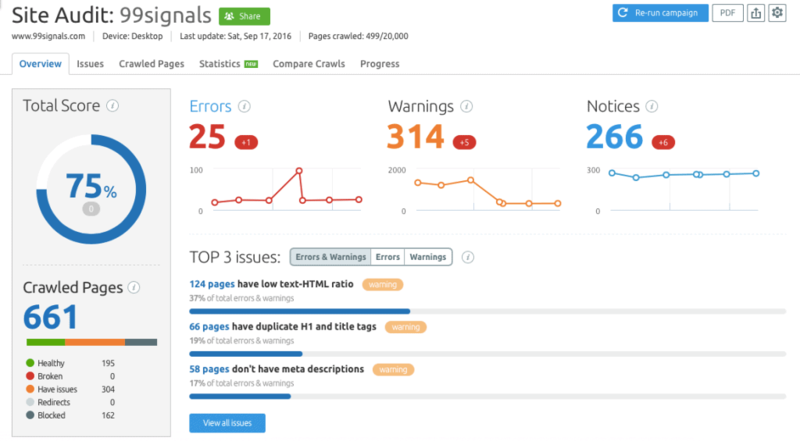 One of my favorite tools within SEMrush is the Site Audit tool. This tool allows you to identify errors, warnings, and issues with your website, and then provides recommendations to fix them promptly, thereby improving your website’s overall SEO health. By running regular site audits, you can ensure your website meets Google’s parameters on site speed, responsiveness, and more. In addition to fixing on-page and technical SEO errors on your website, you can also use SEMrush’s phenomenal keyword research capabilities to find profitable keywords in your niche and also spy on your competitors’ top ranking keywords. SEMrush is just as well known for its advertising data as it is for SEO. The tool reveals your top paid search competitors, allows you to see the keywords they are bidding on, and even provides a sneak peak at their ad copies. Furthermore, you can quickly estimate their PPC spends and uncover opportunities to skyrocket your ROI. Using SEMrush’s PPC toolkit, you can find cost-effective ways to generate new leads and sales for your business. If you’ve never used SEMrush before, I’d urge you to sign up for a 14-day free trial of SEMrush PRO to test out all the features yourself. Also download our FREE PDF – “The Ultimate SEMrush Playbook” to get the maximum benefit out of your 14-day trial. How do you convert visitors to your website into leads? By using a top-notch landing page builder and following the best practices to optimize your landing pages. Third-party integrations. 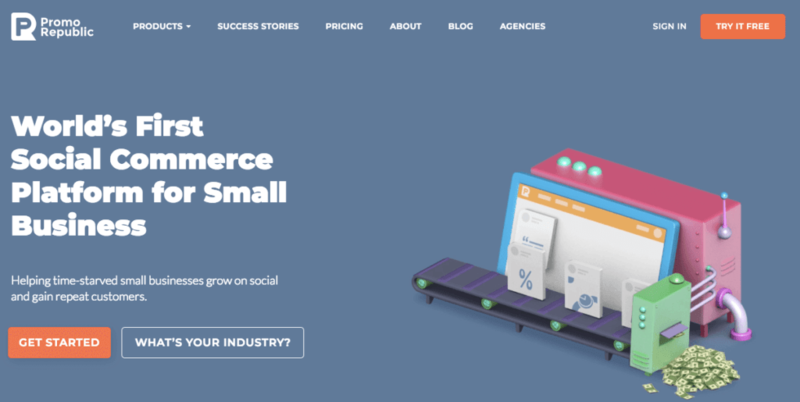 Ex: WordPress, Mailchimp, Zapier, etc. One of my favorite landing page software is Instapage — a tool that has all of the features listed above and more. Using Instapage’s easy-to-use drag and drop page builder, you can design stunning landing pages and publish them in no time. Whether you’re planning to increase the downloads of your latest eBook or promoting your mobile app or need more registrations for your upcoming webinar, you can use any of Instapage’s 200+pre-designed mobile-friendly templates which are conversion-optimized to maximize leads for your business. When it comes to social media management, I use several tools — Buffer, Shorby, Grum, Planable, and SEMrush’s Social Media Poster to name just a few. But there’s only one tool which can be considered the ultimate social media management package. A tool that can help you create content, curate content, and even schedule content on all the major social media platforms. And that tool is PromoRepublic. 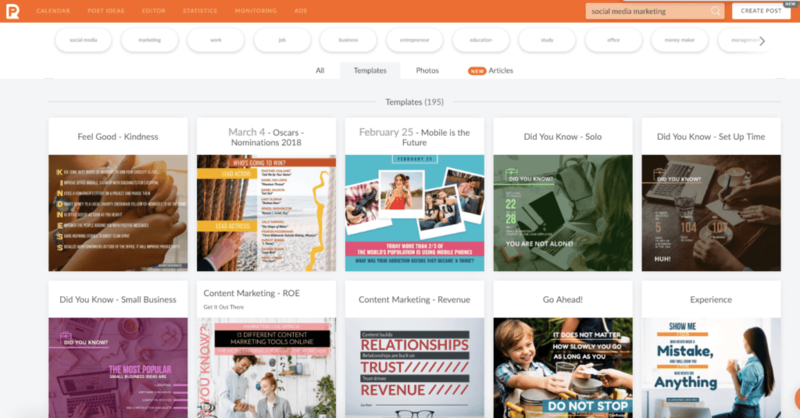 PromoRepublic is currently the fastest growing social media management platform which provides content suggestions and templates with its content suggestion technology. My favorite PromoRepublic feature is the post ideas library which contains 100,000+ hand-crafted visuals, integrated photo stocks, and easy-to-use graphics editor. To find relevant graphics for your need, you just need to type in a topic or keyword in the search bar and hit the ‘Search’ icon. Based on your search, you’ll find tons of relevant social media templates which can be customized to suit your requirement. With the graphics editor, you can insert your logo, change the font and colors to match your brand guidelines. Once you’re satisfied with the graphic, you can share or schedule it with captions on all the major social media platforms. Since PromoRepublic is integrated with all major social networks and provides in-depth insights into the performance of your posts, you can easily use it as a social media scheduler as well. When it comes to effectiveness and ROI, there’s nothing better than email marketing. Email marketing has an ROI of 4400% and $44 for every $1 spent. And according to McKinsey, the average order value of an email is at least three times higher than that of social media. These stats are too remarkable to ignore. 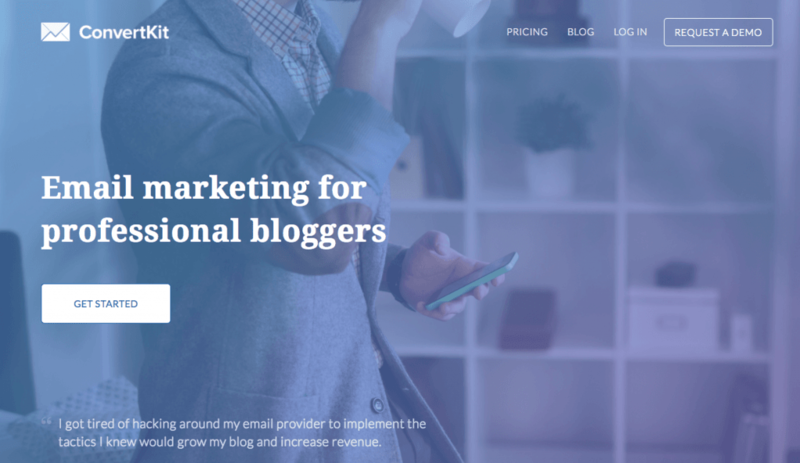 To do all of the above and more, I’d recommend using an email service like ConvertKit which has quickly become the preferred email marketing software for leading bloggers, podcasters, and marketers. 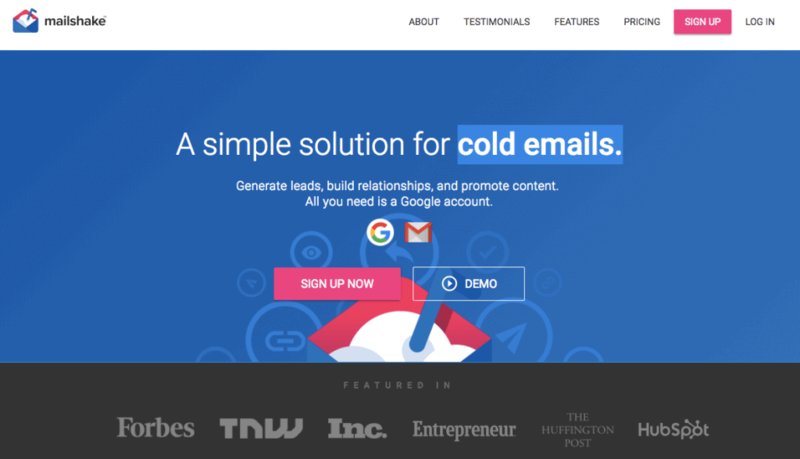 One of the most widely used features in ConvertKit is its email automation feature. 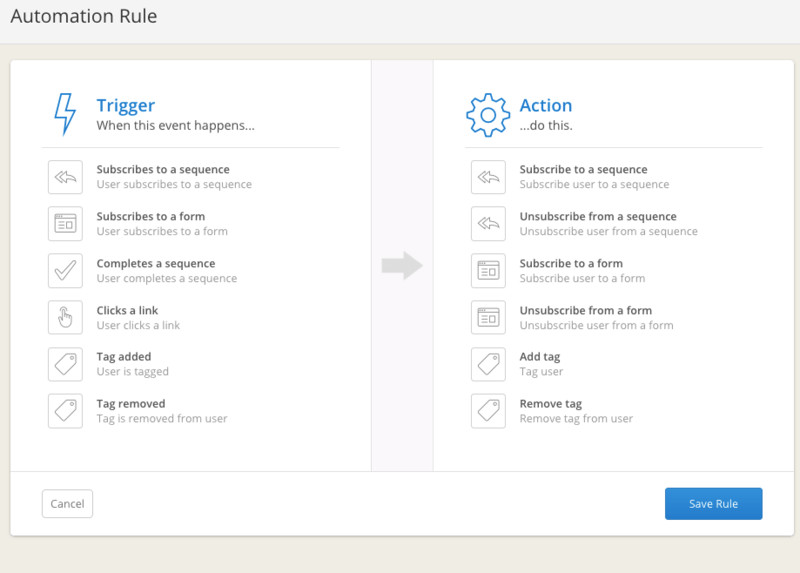 With ConvertKit, automation is based on a simple “if this / then that” sequence. 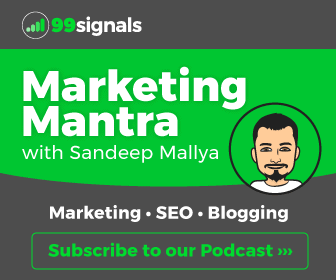 There is a bit of learning curve involved here, but once you familiarize yourself with this feature, you’ll realize how powerful it is and how quickly it can grow and nurture your email list. And it is this feature that sets ConvertKit apart from other email marketing services in the market. You can determine who receives sequence emails and when they receive them by setting up a number of ‘triggers’ and ‘actions’ that will execute when the trigger’s condition occurs. In addition to this, you also get professionally designed lead capture forms with ConvertKit which you can use at strategic places on your website to grow your email subscribers. ConvertKit gives you a lot of control over the design of these lead capture forms. That said, the opt-in forms won’t win any design contests and can’t be compared with other professional lead generation services like OptinMonster or Sumo. But they are definitely superior to lead capture forms provided by other email marketing services like AWeber and Mailchimp. So if you have a limited budget and can’t afford to spend on an additional service, the lead capture forms within ConvertKit will do the job. According to Content Marketing Institute, content marketing gets three times more leads than paid search advertising. As such, it’s becoming increasingly important for marketers to have a robust content marketing strategy. In order to be successful at content marketing, you need to deliver unique content that entices your target audience and influencers to engage with your brand. 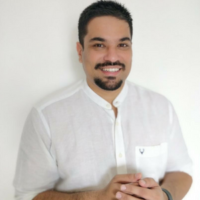 Buzzsumo is one such tool which can help you create unique content on trending topics in your niche and also help you find relevant industry influencers who can market your content for you. The tool provides you with invaluable content insights by discovering what content was most shared across all social networks. Using Buzzsumo’s influencer search, you can find influencers in your niche and filter by factors such as page authority, domain authority, retweet ratio, average retweets, and so on. In addition to this, you can monitor your competitors’ most popular content and get alerts when a competitor publishes new content. When combined with a blogger outreach tool (coming up next), Buzzsumo becomes a powerful link building tool as well. Once you’ve done identifying influencers in your niche using a tool like Buzzsumo (see above), it’s time to use a blogger outreach tool to connect and engage with these influencers and start promoting your content. There are tons of blogger outreach tools on the market, but the most affordable and efficient is Mailshake, a blogger outreach software that helps you generate leads, promote content, and build strong relationships with top industry influencers. Pre-written outreach templates: You can select from a massive pool of pre-written messages. Just answer a few simple questions and Mailshake will generate a personalized email for your campaign. Automatic follow-ups: You can schedule follow-up emails triggered by link clicks. Mailshake stops the sequence when a reply is detected, handles unsubscribe requests, and ignores auto-responders. Personalization: Mailshake allows you to merge fields to quickly customize your messages. You can preview every single email and make edits efficiently. Powerful integrations: Mailshake is integrated with premium services like Zapier, Google Forms, and Salesforce to help you successfully craft your outreach strategy. Chatbots were all the rage in 2018 and will most definitely be ubiquitous in 2019 and beyond as the chatbot technologies continue to evolve. Using chatbots, you can automate processes like customer support and eCommerce, and even improve the overall user experience on your website. 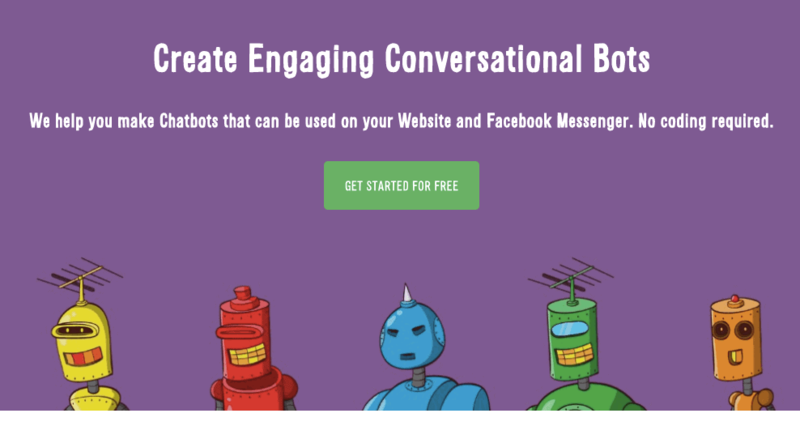 I’ve used several chatbots in my quest to find the ultimate chatbot for business growth, but the one that I’m most comfortable with and the one I recommend most to my clients is TARS Chatbots. TARS enables individuals and businesses to create chatbots that can be used on your website without any programming knowledge. The chatbots created via TARS can be used for ordering/booking process, feedback collection, webinar registration, training, and customer support automation. In addition to these, you can also use TARS to create conversational landing pages to improve your PPC conversion rate. The platform is incredibly easy to use and the customer support is fantastic. TARS provides pre-designed templates that you can use to quickly create chatbots and the support is available 24/7 to guide you in creating chatbots that are customized to your requirement. We created our own content marketing chatbot using TARS. You can find a lot more bot examples created via TARS on this page. Now that you have information on all the best marketing tools and how to make the best use of them to grow your business, it’s time to put these tools to the test. I’d love to hear your thoughts on all these tools, so please share them in the comments section below. You can share your experience with these tools, and also reveal some of your favorite marketing tools that are not featured here. Fantastic collection of marketing tools and I am grateful for your listing of what you consider to be the best marketing tools for all aspects of the marketing process. I have been looking for a recommendation for a good source for Landing Pages and I will look into the recommendation. I am going to bookmark this site as I want to look into the websites listed. Thanks for a great article. Thanks, Bill. Glad you found it useful. I will check out PromoRepublic for my new media activities. Thanks as always for providing such great content.